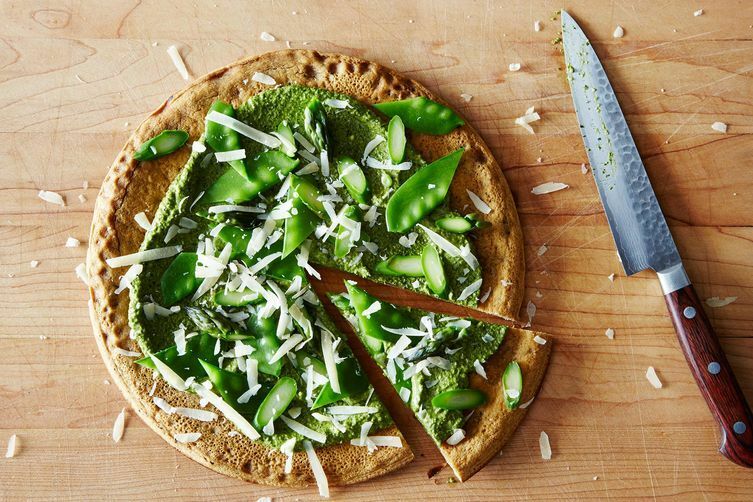 Congratulations to Shell, whose Vibrant Spring Socca won the contest for Your Best Recipe with Chickpeas! I believe that food, cooking, and eating is meant to provide more than sheer sustenance and should be an experience that brings people together. Growing up, we dined as a family every night; it was a time to share stories, to fill each other in on the happenings of our lives, and to vent. It was healthy. I am grateful that my parents placed such an emphasis on the dinner table. I value the nutrition that food provides the body, but above that I treasure the time I get to spend around the table with those I love. This one is easy! Grating cheese. Especially mozzarella. It is the first task I hand off if I have help in the kitchen. Ask any of my friends -- they've all graciously stepped in to grate. A good chef's knife is a must. Aside from that I love my microplane. Citrus zest adds a boost of flavor to just about anything, sweet or savory. I realize how contradictory I'm being to my previous answer, but zesting and grating are completely different tasks in my mind. My most vivid memories of cooking as a child involve my dad and a grill. Whether we were camping, entertaining, or just making dinner on a Tuesday night, the grill was almost always ablaze. I find comfort in eating just about anything fresh off the grill, and my dad's barbecue ribs are my favorite treat. Hmmm. The first thing that comes to mind was an early morning flour disaster I had while working at a local bakery in college. I was opening, the dreaded 2 AM shift, and I was making the dough for our scones. Everything was in the Hobart mixer, I turned it on without looking at the speed nob (a mistake I will never again repeat), and flour went everywhere. Literally. I am looking forward to trying this recipe...such a wonderful idea! Congrats on the win! I've loved socca ever since my first trip to Bar Rene in Old Nice. And what a lovely spring twist!